In JINGLE, Arnold is that done-to-death fallback American trope of the working-father-with-no-time-for-his-son (Jake Lloyd, aka Anakin Skywalker to a whole generation of disappointed/outraged STAR WARS fans). 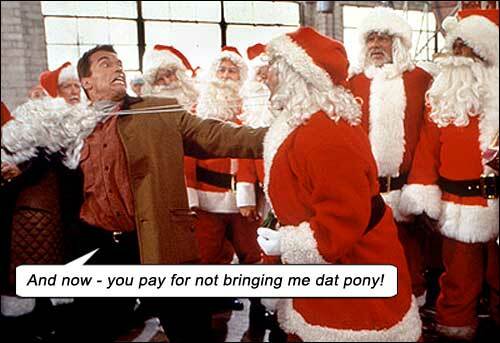 To show he cares, Arnold promises to get his son a Turbo Man action figure for Christmas. But they’re sold out. So begins his shameless quest to beg, borrow or steal a Turbo Man. Sinbad is Arnold’s nemesis, seeking the same toy for his own son. 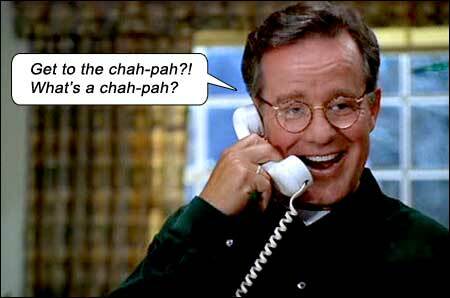 Phil Hartman is the intrusive neighbor, who should be termed “sleazy” for trying to make Arnold’s wife (Rita Wilson), but somehow pulls off a jovial performance where he is almost incognizant of his own desire to sleep with her. It all adds up to the usual mixed Christmas messages of crush kill destroy everyone in your quest to do something selfish tarted up as selfless. Misdemeanors, felonies, senseless acts of violence all contribute to the madcap fun. Bring the kids. I cannot believe the gutless MPAA – or at least test audiences – allowed some of the more moronic sequences to remain in the film, such as Arnold beating up a factory full of Santas, or punching a reindeer. In an adult comedy reaching for absurdity or outrage, I would welcome this level of insurrection, but this is an avowed kid’s vehicle. Must be nice for your eight-year-old to see Santa getting bitchslapped by the Terminator. Send your Thank You letters to director Brian Levant and writer Randy Kornfield. The final sequences, where Arnold inadvertently finds himself dressed as Turbo Man aboard a Christmas float parade, complete with jet pack and chromakey flying effects, topped off by Arnold’s son and wife displaying Lois Lane incognizance in not recognizing him in the suit, is mind-numbingly unwatchable. Still, Arnold’s spoken asides to himself (in lieu of actually acting the emotions) are priceless. And who better to fill out the musclebound contours of a superhero suit than a guy with the body of a superhero? Don’t votch dis film if uvonthu live. Starring: Arnold Schwarzenegger, Sinbad, Rita Wilson, Phil Hartman, Martin Mull, Jake Lloyd, Robert Conrad, James Belushi.